Device used to convert solar energy directly into electric energy (photovoltaic effect). 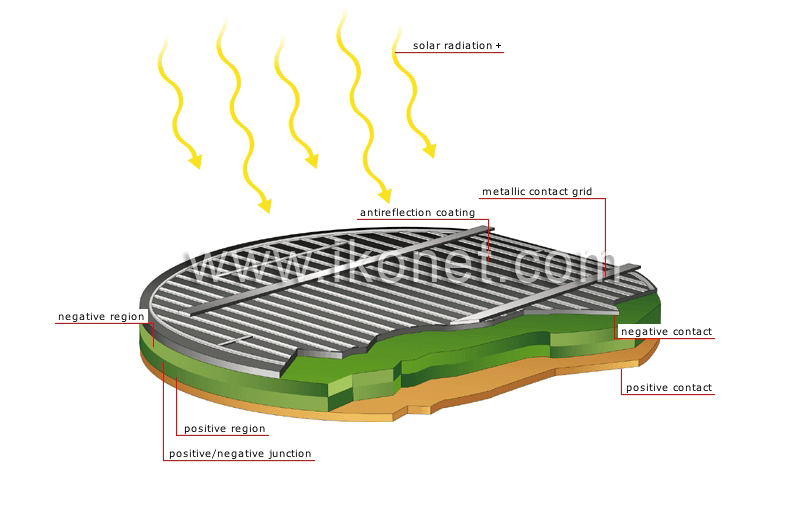 Coating product that is deposited on the negative region to reduce light reflection and optimize solar radiation absorption. Layer of semiconductive material (silicon) to which phosphorous is added to release electrons. Layer of semiconductive material (silicon) to which boron is added to produce a layer with insufficient electrons. Contact area in which electrons are exchanged between two layers to create an electric current; radiation moves the charges between these regions to create voltage. Metal element that ensures that the electric current flows through the circuit to which it is attached. Metal grille that collects the electric current being generated.